Ever since next-gen consoles emerged on the market nearly a decade ago (can you believe the Xbox 360 launched in 2005 and the PS3 followed in 2006? ), bringing with them the improved graphics capabilities associated with HD video, as well as the inclusion of beefy computer components and online connectivity hardware missing from previous products, the consumer public has expected bigger and better things in the realm of home gaming devices. The original PlayStation came out in 1994 and was followed by the PS2 in 2000, so with six years between major product upgrades it seems like we’re due for the next amazing iteration from Sony this year. Unfortunately, the rumor mill says that all we’re likely to get is a slimmer version of the PS3…again. You may recall that the original PS3 got a bit of a revamp three years ago with a slenderized casing. And now, Sony is releasing not the upgraded gaming console that fans of the device are no doubt hoping for, but rather another cosmetic overhaul that is once again slimmer than the last (as we all suppress a yawn). In truth, we may not even see this meager scrap of innovation. 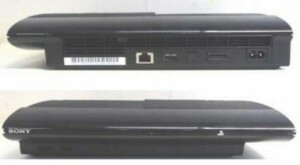 The information comes from an FCC filing submitted by Sony just a couple of weeks ago in which a new version of the PS3 is supposedly referenced (referred to as CECH-4000 whereas the most recent iteration was called CECH-3000). Of course, there is as yet very little information (and no official confirmation) of this newly revamped PlayStation, but that hasn’t stopped plenty of tech sites from speculating about what the consumer public might be in for. The schematic featured in the FCC filing is nothing more than a line drawing with dimensions listed, after all. But thanks to a leak out of Anatel (basically Brazil’s version of the FCC) there are some photos floating around that allegedly feature the new PS3. Changes appear to include not only a sleek, slim case, but also a new way to insert discs (through a sliding tray on the top of the machine rather than a slot in the front). However, there is little information about possible internal upgrades, which are no doubt of more interest to the serious gaming crowd. Apparently, the Anatel filing that was leaked contains notations that include 16GB (perhaps a typo that should have been 160GB), 250GB and 500GB, but little else to indicate that the inner workings of the PS3 will change. None of this bodes well for the selling power of this new and “improved” version of the popular console. The problem here is twofold. For starters, console sales are flagging. Households equipped with a couple of next-gen consoles already aren’t likely to purchase a new one without sufficient upgrades to recommend it. And with mobile gaming gaining popularity, the next logical step is for consoles to offer connectivity and interactivity. This means cloud gaming that allows users to access save points for their FPSs or Sonic Games 365 days a year, 24 hours a day no matter where they are. But many people are also interested in the concept of ditching handheld controllers and using more versatile tools (like smartphones and tablets) to wirelessly play through their consoles on larger monitors. So until Sony engineers such upgrades or comes up with something even better, their only hope is to significantly drop prices on their gaming hardware. Even that is unlikely to help much.